If you made it to this point in the series you have the knowledge to start brewing all-grain. I brewed this batch of beer with one of my buddies and took pictures of it so we’ll go with this recipe. It kinda falls under a mixer of ingredients that we had lying around but it is what I would refer to as an easy drinking beer. You could give this to about anyone and they would enjoy it. So you need to either mill up those grains or when you go to you order the grains ask for them to be milled. AND NOW WE ARE READY! You’ll see that in the pictures I was using one of the mash tuns that is a pot, but it’s the same process if you made your own. You want to go to this link and type in the amount of grains you have, what temp they are at, and what temp you are going to be mashing at. When it comes to the part that says “Constants” just leave them unless you know what you’re talking about. 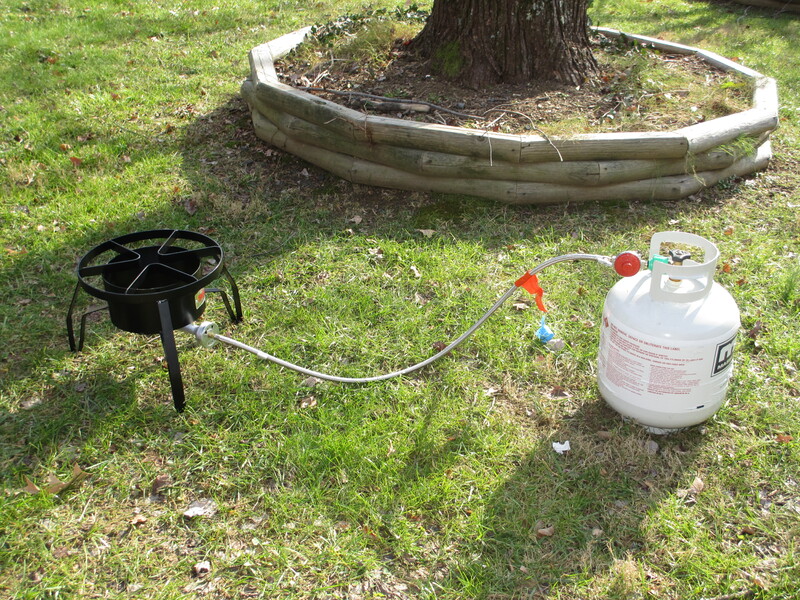 I start off by heating up the sparge water. This is the water that is going to be used to rinse the grains. I put this in an extra cooler. 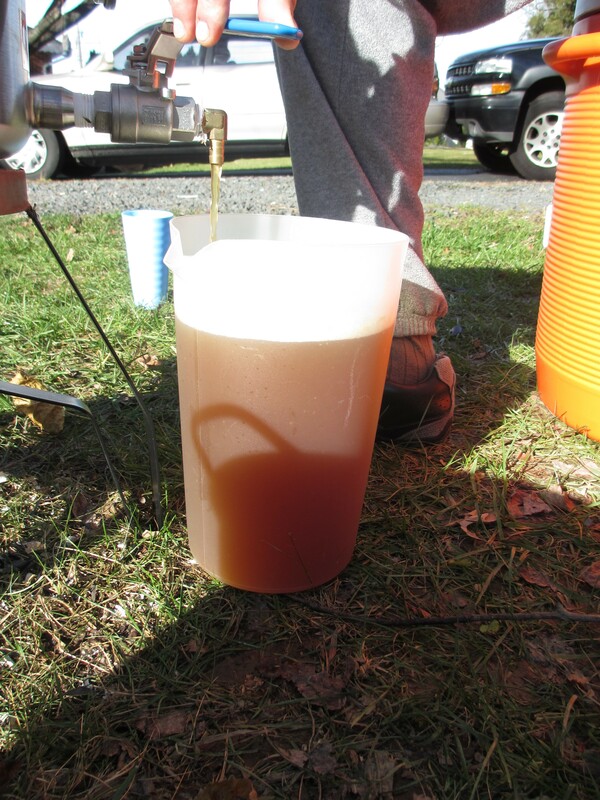 The sparge water I heat up to 175F, and it is 5.5 gallons that I need. After I put that in the extra cooler, I close the top and forget about it for a bit. After that, I end up heating up the mash water which is 3.5 gallons to 165F. Put that in your mash tun, then add your grains. Once you have added your grains stir them around and make sure that it doesn’t have any clumps in them. Check the temp. For your first batch I wouldn’t worry too much about hitting 152 exactly. You should be in the ballpark though, 149-154. If you are low, take some water (1 qt) throw that on your stove bring that up to a near boil and slowly add that to your mash. Stop when you get in the ballpark of 149-154. If you are high on temp, start stirring and that usually cools it off. If you are really high add some cool water (1 qt) and stir. What’s nice about these pots which are mash tuns are, if you are low in the temp you just turn on the heat, and the solution is solved. Considering that you haven’t blown a socket yet and you’re still in the game, we let the mash sit for 1 hour. At this point I would play your favorite pump up mix because it’s going to be a little bit. An hour has passed and it’s time for the next step, VORLAUFING. Take a pitcher of some sort, put it under your spigot and open it very slowly. Collect it and pour it back on top of your mash. When you pour it back over your mash do it slowly over a spoon. The idea behind this is that you are essentially creating a filter with your grain bed. Each time you do this you will see less, “floaties” in the mixture. The objective is to have the clarity similar to that of freshly pressed apple cider. It normally takes about 12 times of doing it with taking about a liter or two of the mash each time. Once the clarity is that which you want, open the spigot slowly and start collecting the wort in your brewing pot. This is referred to as your first running. Once there is a trickle of water coming out the spigot on to the next step. Now remember that water we set aside in the beginning? Close your spigot and then pour that water on top of the grain bed. Stir around breaking up the clumps and let it sit for about 10 min. 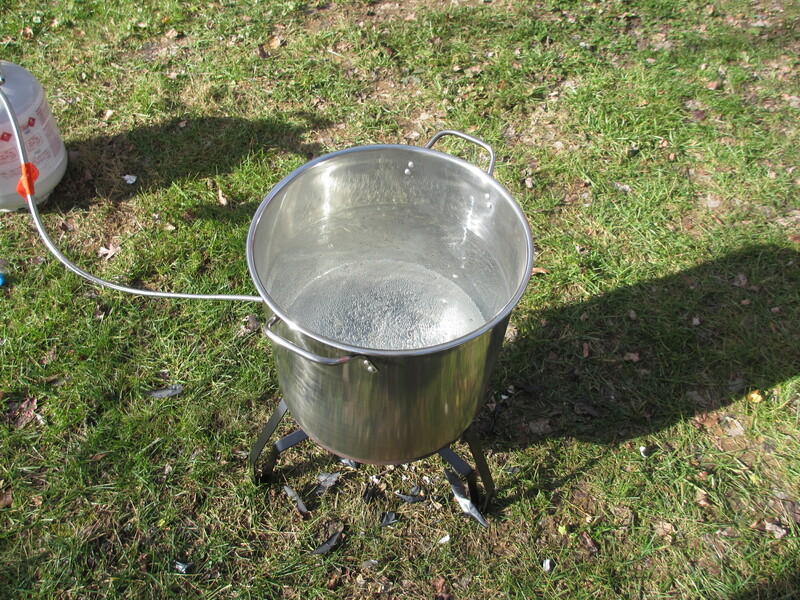 Do the VORLAUFING process once again and then collect it in your pot. What you collected is your second running. 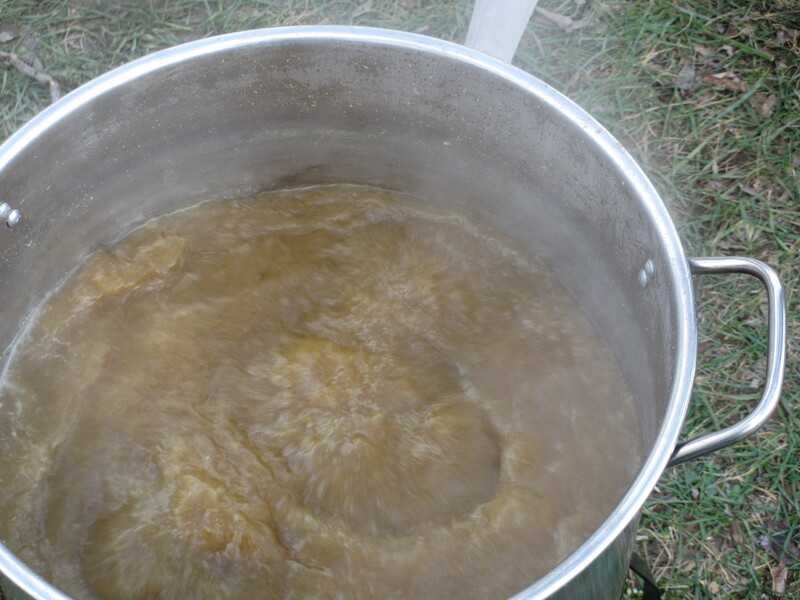 You should have about 6.5 gallons of wort now in your pot. At this point, you are at the same point that you would have been at if you just added malt extract. 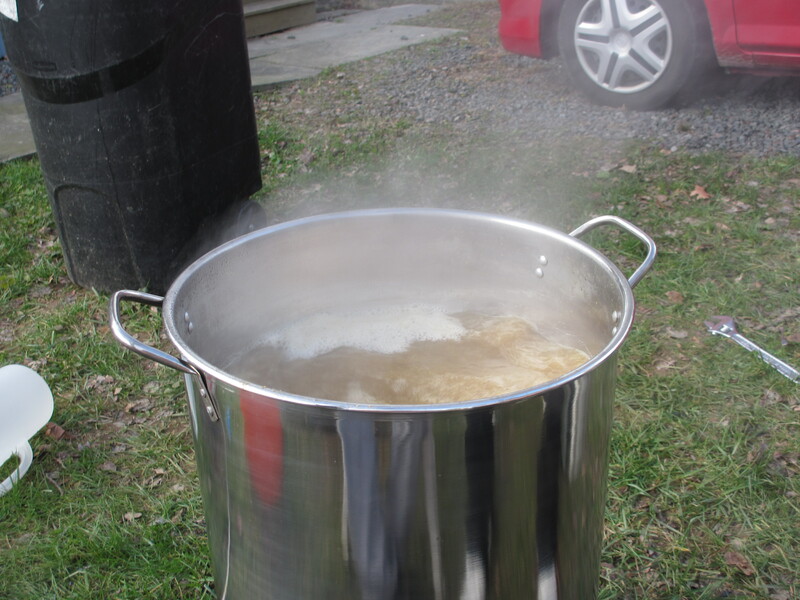 So bring the pot to a boil, and just add the hops when needed. The grains which you have you can just throw those away or I’ve heard of people making dog biscuits out of them if you didn’t want to throw them away. I would not put them in the garden however. I heard this couple doing that up in Alexandria, next morning they had 15 rats the size of cats eating away at the grains, so I would not advise. But that really is all-grain brewing. Not to hard. I hope that this series added some clarification to it. Another piece of advice, start off with forgiving recipes not delicate ones. Milds, browns, darker pale ales – those are pretty forgiving. Great inofomation!! Best walk though I’ve seen for going into all grain. Can I post this link on my You Tube page? Well thank you, and most defiantly! For the love of God, proofread! Sheez. Amazing post. Simply amazing post. Terrible grammar though. Sorry about the grammar, but thank you for the compliment! I went over it again, fixed it up. Sorry about that – this post was written a bit ago. Glad it was helpful. That was a great series, it really helped me out. I wish I would have read the other article before I ordered a conversion kit for a mash tun, lmao. Can’t wait to do my first all grain batch! Thanks Casey! I’m glad it helped. I enjoyed writing up the series. I think we are going to be doing a few other series pretty soon been thinking about a few. If you have any ideas for them just let me know and I can see if it’s possible to fit them in the future. But I would like to get at least one more series done before the year is out. 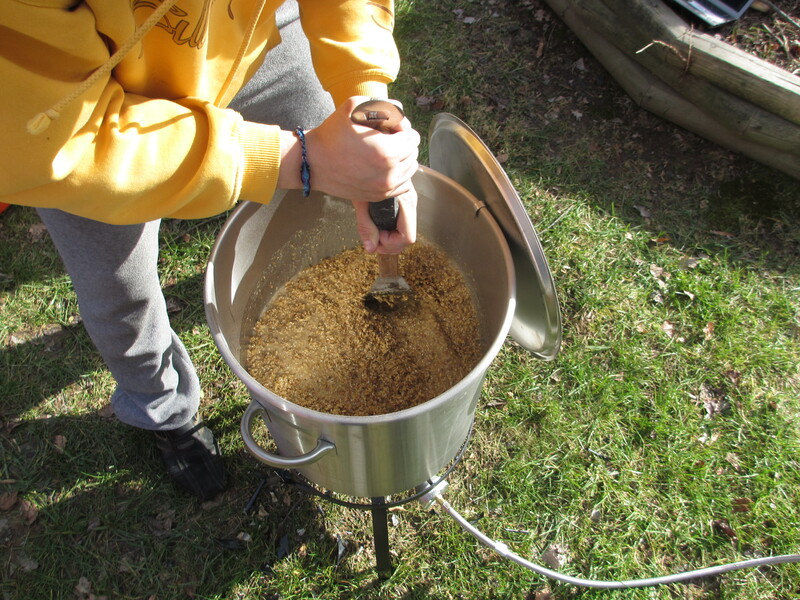 I find the series are nice because most people understand the macro scale of homebrewing but it really gives people (including myself) a bettering understanding/confidence to know the how any why on a micro & step-by-step application. Full circle, I’m glad that you enjoyed it!